Approximately 3 months ago, David Warlick asked people around the world to “say hello” to a conference room full of educators in Hawaii. I was amazed at how quickly people responded and connected. Well, in reference to an oft quoted movie, he “had me at hello.” This was my first introduction to Twitter. Since then, I’ve grown addicted to this micro-blogging tool with the cute name. Cute…but powerful. Not only am I able to keep up with friends that I don’t see on a daily basis, but I’ve managed to connect with new ones who share the same interests. Maybe not all of these connections will be lifetime ones, but they are fun and fulfilling while they last! The Olympics, for example, has set me to exchanging stats and updates with a number of new people. I doubt many of these interchanges will last beyond the closing ceremonies, but perhaps I’ll see a few familiar “tweets” during the 2012 games in London. On another note, I’m also following the conversations of experts such as Alec Couros, Wes Fryer, and Angela Maiers. I’ve learned about incredible PD opportunities, links, and websites from a number of other education experts, perhaps not as well known, but definitely as well-versed in their own arenas, right here in Hawaii. In a few short weeks, Twitter has become an indispensable source of information. And yet, because of Twinkle, I’ve seen a whole different side of Twitter that has left me shocked (though I shouldn’t be) and feeling a need to respond (which I should). 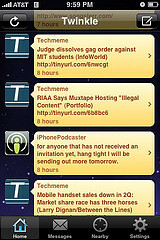 Twinkle allows you to add your current location to your tweets, as well as seeing who else who is nearby. You are able to see the tweets of anyone on Twinkle within a certain distance from your location regardless of whether or not you follow them or they follow you. While this has allowed me access to a number of interesting conversations, it has also been similar to stepping into a nightclub atmosphere! This in itself does not bother me. I know these conversations are not meant for me, and I can choose to read them or not. What did bother me were some aggressive words, threatening violence towards another Twitter user. Cyberbullying is by no means a new problem. Countless headlines have demonstrated an abuse of power, power given to individuals by the internet and its tools. But sometimes we fail to see that this power can also result in incredible positives when channeled properly. Hence, this is what we as educators and parents must do. We must give students the tools to use this power wisely and with good purpose; to participate in the global community with compassion and empathy. Just as cyberbullying is not a new problem, neither is a teacher’s charge to instill and inspire good citizenship in his or her students. We simply need to further the reach of our teaching and learning to include cyberspace. I’ve been following, with great interest, an outreach for resources on digital citizenship on the internet the past few days. Ironically, this conversation happened on Twitter. Two sides of the same coin. Let’s open our conversations to include digital citizenship more frequently and with greater urgency, especially at the beginning of the new school year when building community is a staple. These tools are here for us to show our students the world and to help them shape it into the place they want it to be. Rather than ignoring their existence, use them frequently, and use them well. I am getting the same feeling about Twinkle. It really has opened up my eyes to the other side of Twitter, and to likely what MOST people are using it for. Edubloggers have developed fairly restricted ways of using it … it’s really interesting to peer into the lives of others through the tool. All the best, thanks for the post, I’ve subscribed. Reflection and Gratitude: August 2008 | Angela Maiers Educational Services, Inc.